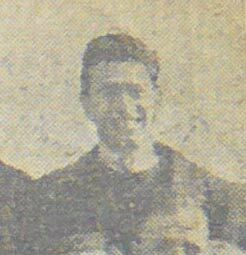 Two men with the name Frank Williams are currently listed as having represented the Carlton Football Club – Francis Henry Williams, who appeared in ten matches for the Blues way back in 1907-08, and this one; Francis Peter Williams, who managed three games over two seasons while studying law at Melbourne University prior to World War II. This Frank was recruited from University Blacks, having also played previously for St Kevin’s College and Carlton 2nds. He wore guernsey number 18, and made his debut on a centre wing for the Blues in a good win over Hawthorn at Princes Park in round 14, 1936. His only other senior match for that year came a fortnight later, in a narrow, 8-point victory over Footscray, also at Princes Park. He then had to wait until May of the following year for a third opportunity, only to suffer his first defeat by 2 points at the hands of North Melbourne. By then, the war clouds were building up over Europe, and many young men were about to be confronted by the prospect of another major global conflict. Frank was already a member of the Militia, but thinking seriously about joining the Air Force. By that year’s end it was obvious that he would not find it any easier at Carlton, and so decided to switch clubs and join Melbourne. Over the following four years, as World War II spread across the world, Williams completed his degree, signed on with the RAAF, and in between, played another four senior games for the Redlegs (1938 to 1941). In 1942, his football career ended when he was accepted for pilot training. Just over a year later he graduated with the rank of Flying Officer, and served with RAAF until shortly after the Japanese surrender in August, 1945. After he was discharged, Williams returned to private law practice in Melbourne and rekindled his love of Australian football. He later struck up a friendship with Carlton secretary Ian Collins during the 1980’s, and for a while worked in the financial area of the club’s administration. He died on July 14, 2005 at Balwyn, aged 90. 1937 June 30, The Age; "Williams has rejoined the Old Paradians club in the Metropolitan Amateur League." "Frank Williams, son of the Carlton Cricket Club president, joined Melbourne after playing a few games with Carlton. He is a Melbourne City Councillor, and was a practising solicitor at the time of enlistment." Contributors to this page: blueycarlton , molsey , Bombasheldon , PatsFitztrick , tmd1 , Jarusa , p(12)terg and WillowBlue . Page last modified on Wednesday 06 of August, 2014 08:04:53 AEST by blueycarlton. 1972 Prelim. Final Vs St Kilda Match Summary.